Fancy candies are nice, but sometimes you want to cut out the frills and get right down to what matters: the sugar. Basic rock candy is in a way the purest form of candy, since it is 100% sugar. It’s even purer than table sugar, since the process of creating rock candy removes all impurities and leave you with nothing but the good stuff, wholesale bulk candy. In fact, when you make it yourself it’s even cheaper than wholesale! As you might imagine, rock candy has been around for years, dating back to perhaps the 1200s, or perhaps even the 800s (if you believe Wikipedia). Shakespeare made a rock candy in Henry IV, describing it as something of a throat-soothing lozenge. Making your own rock candy couldn’t be simpler. Science Bob provides the most basic recipe, which calls for a cup of water and two to three cups of sugar. You boil the water, stirring in the sugar a little at a time and letting it dissolve, until no more sugar can be dissolved. Take it off the heat, let it cool, pour it into a jar, and hang a string or stick from the top. Voila! In a few days you’ll have some solid sugar crystals. While it’s nice to have such a simple recipe, candy enthusiasts sometimes need a little more. 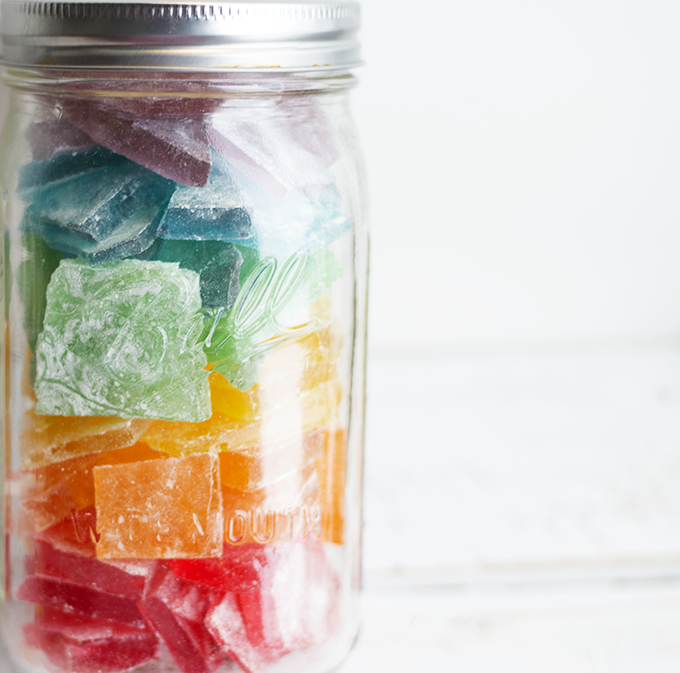 So we bring you six more rock candy recipes that will test your candy making creativity. 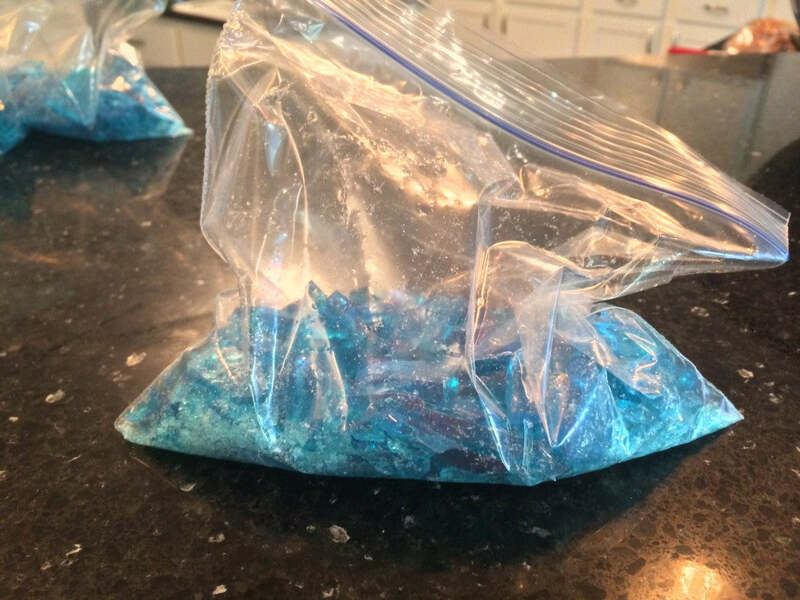 In celebration of the show’s finale, which aired in 2013, Becky from The Cookie Rookie created a buffet of show-related foods, including Heisen burgers, Funyuns for Jesse, and of course some Blue Sky meth. Which is of course rock candy, in case there is any possible confusion. See how they did it at The Cookie Rookie. OK, so maybe we missed the boat on this one. We do, after all, have over 11 months until Christmas. But in reality, we don’t need a specific holiday to enjoy some tasty rock candy. And, since we’re still in the dead of winter, most Christmas-themed foods work fine right now. This recipe brings a few new elements into the fold. First, it uses cinammon oil instead of extracts or artificial flavors. Second, it adds an element we’ll see in future recipes: powdered sugar. Because, why not? Get the goods at My Serendipity Life. Remember, rock candy is really for the kids. As mentioned in the Science Bob article, they stand to learn something about chemistry when they make it. Also, the process is fun, so we should let them partake. 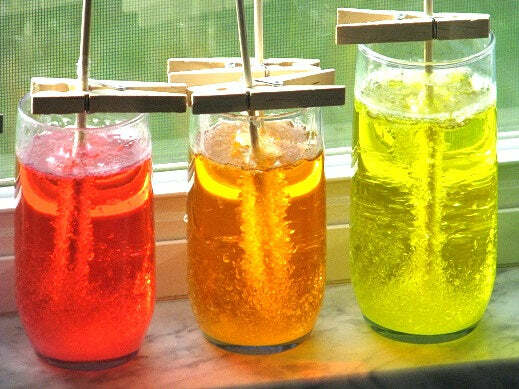 The blog Gluesticks embodies the spirit of rock candy creation with a rainbow-ed array of colors of rock candy swizzle sticks. The best part about creating rock candy of varying colors is that you can play with flavoring. Essence oils, extracts, and even artificial flavorings let you go nuts with combinations. Share in the fun at Gluesticks. Hey, adults can have their fun as well. 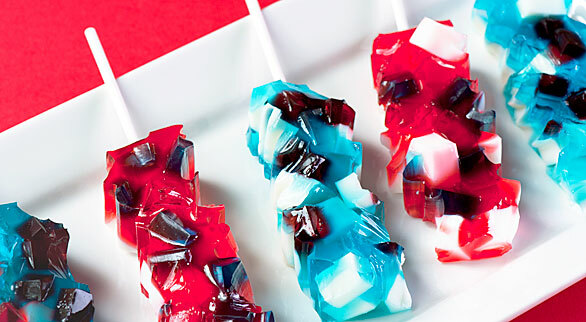 This recipe adds another new element to rock candy: gelatin (read: Jello). That, and condensed milk. Yes, it makes a very very strange combination. It’s also not created like your standard rock candy. But boy is it delicious. And we’re not just saying that because of the alcohol. If you want the kids to get in on this, there’s an easy substitution. Just use lemon lime soda, such as Sprite or 7-Up, in place of the alcohol. We think you’ll really love these, even if they’re not rock candy in the strictest sense. Try it out at Tablespoon. 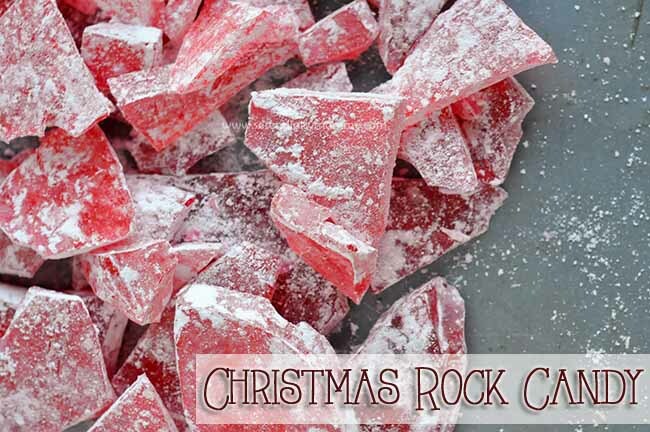 Throughout this post we’ve mentioned artificial flavors for spicing up rock candy recipes. What artificials do we mean, specifically? Well, Kool-Aid is one. 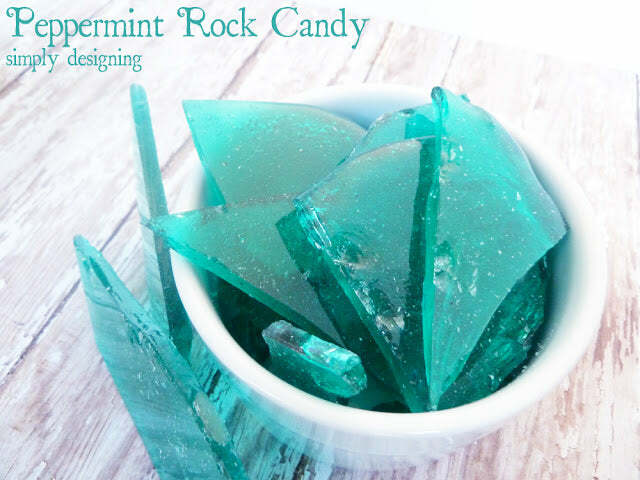 Amber at Snippets of Design created a fun rock candy recipe that uses Kool-Aid, which is essentially flavored sugar, right in the mix. As with the rainbow rock candy, you can really go nuts with your colors and flavors. The recipe even calls for food coloring in addition to the Kool-Aid, which adds coloring itself. You can create different combinations, or really enhance the color of the reds and the blues. Check it out at Snippets of Design. While we’re on the blue theme, we can’t forget Disney’s Frozen, the movie sensation of 2014. While adults can enjoy rock candy as much as anyone, really we make it for the kids. Right? 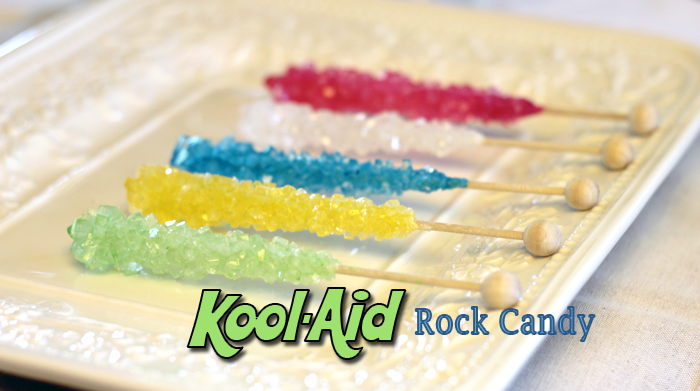 So they’ll certainly love this take on rock candy. What’s the difference between Frozen rock candy and Blue Sky rock candy? The flavors, for one. Frozen uses peppermint, while Blue Sky opts for a blue raspberry flavoring. And who can deny that this reminds them of Elsa and her ice world in Frozen! It’s gorgeous. Get the goodness at Simply Designing. Yes, one more recipe for the road. There is honestly nothing that separates this recipe from Cookie Dough and Oven Mitt from the rest. They use the basic ingredients: granulated sugar, corn syrup, food coloring, and flavored oil. But you know what? We wanted to include this one because it’s so well done. Well, there is one difference: this one doesn’t involve a stick. Nor does it involve days of waiting for crystals to form. You just cook it, pour it onto a baking sheet, and shatter it once cooled. Get the recipe at Cookie Dough and Oven Mitt. The greatest part about making rock candy is that you can do literally whatever you want with it. As we saw with the shooters, you don’t even have to stick to the formula. So go nuts. Think of some of the craziest flavor combinations possible and make them. Come up with neat additions to the solution, creating even more colorful and flavorful crystals. And make sure to let us know. Hit us up on Facebook: @acandystore.